Clear, calm, cool. Lows in the 50s. 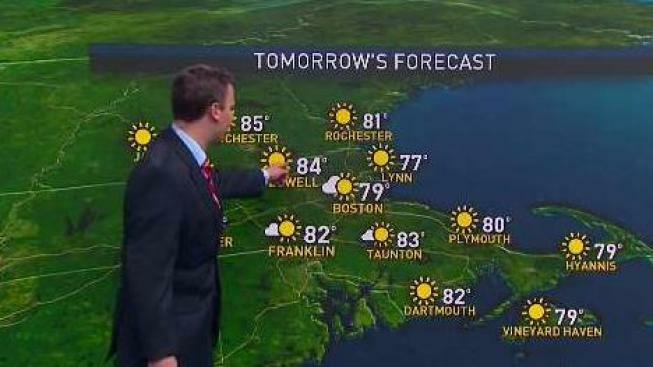 With high pressure building in today, expect a gorgeous mostly sun-filled day across southern New England. Northern New England will see a few spotty showers and in far northern New Hampshire and Maine, but these should subside and disperse by dinnertime. Temperatures through this afternoon and evening will range from the low 80s south, 70s north. By dusk, just in time for those festive fireworks displays, skies will be clear with temperatures slipping from the lower 70s to the 60s, so if you get chilly easily, you might need to bring the light sweater with you. High pressure sticks around for Wednesday under plenty of sunshine and low humidity, with high temperatures near 80. Humidity builds Thursday and Friday as high pressure moves out to sea, allowing for a southwesterly flow and the next system to slide in. By Thursday evening, we could see showers with a few heavy downpours into western New England and rain chances will continue to rise into Friday for most of New England. Highs will be into the low 80s, but slightly more muggy compared to today and tomorrow. For the second full weekend of July, thunderstorms are still possible Saturday, but Sunday looks to be the best day for outdoor plans out of the weekend. The following week remains nice with a few afternoon thunderstorms possible each day and highs remain seasonable - into the 80s.